Beautiful necklace! Well made, and very sparkly. I chose the 0.25 carat, and it is a bit too big for my taste. I think 0.15 carat will look nicer, at least on my neck. I think it is a good value for a diamond necklace. UPDATE: I returned the 0.25 carat and bought 0.15 carat instead - love the smaller version so much better, but that's my personal preference. The quality is superb on both sizes that I tried on, I just prefer the smaller one on myself. Diamond Circle Necklace by Auriya features breathtaking round-cut white diamonds in an open circle symbolizing the circle of life, eternal love or just for a combination of simplicity, elegance, and meaning. 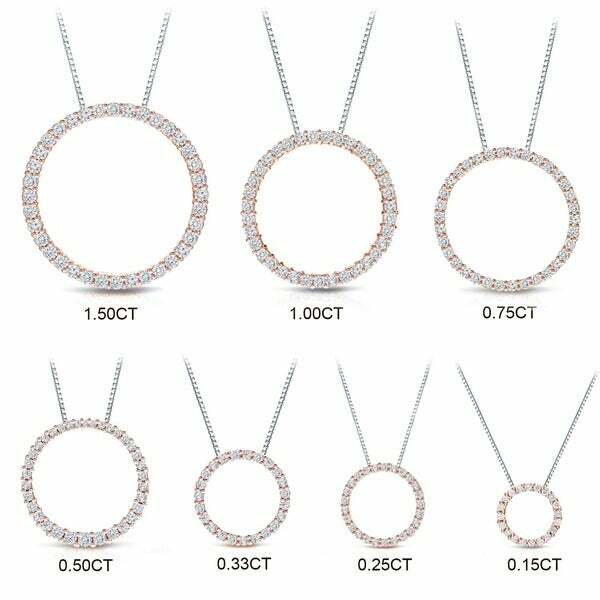 Available in a range of carat weight options, you can choose a size that better fits your style and appeal. This classic open circle diamond necklace is versatile enough to wear from day to night and is hand crafted in a ultra-feminine romantic pink 14k Rose Gold that will endure for generations to come. Available in 1/6ct (0.39-inch), 1/4ct (0.51-inch). 1/3ct (0.55-inch), 1/2ct(0.78-inch), 3/4ct (0.86-inch), 1ct (0.94-inch), or 1 1/2ct (1.25-inch) options. Beautiful. Should've gotten slightly bigger one but it works just fine. Nice clear, sparkling diamonds.